I’ve often asked the question “What is the difference between a blogger and a writer?” Any ideas please, because I’m about to find out! I’m not sure why I decided to sign up and commit myself to the NaNoWriMo(National Novel Writing Month) challenge other than my family have been nagging me to write a novel for the last couple of years. Unfortunately, procrastination is my middle name so the challenge, on the face of it, seemed an excellent opportunity! I must be crazy because to complete the challenge I need to write a novel of a minimum of 50,000-words in a month. The challenge starts on the 1st of November and finishes at midnight on the 30th. Reading the about page I’m assured “This is not as scary as it sounds” Yeah, I’m not convinced. It’s probably right up there with being invaded by Zombies! Who else has signed up to NaNoWriMo? White insects in soil…what are they? Hi Carol and welcome! Thanks for stopping by 🙂 Did you try the challenge last year? Hi Sarsm, that’s great! To be honest I feel nervous just thinking about it! What’s stopping you? I’m not sure what I want to write falls into the rules… I’ve written to them to ask them. Let’s see! Ignore the rules – seriously. The purpose of NaNoWriMo is to write and have fun with other writers. If you have a great idea, write it. 50,000 words is 50,000 words. Hi Jessica, thanks for stopping by! I love to have fun while I’m writing so I should be OK…she says hopefully. I’ve just never written so much in one go, but I’m determined to succeed. A bit like a sponsered charity walk! LOL – one word at a time! 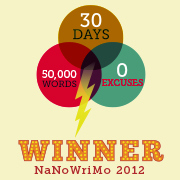 I’ve added you as a buddy in NaNoWriMo, so we can cheer each other on. Hi Jessica, how do I add you as a buddy on NNWM? Go to my profile page http://www.nanowrimo.org/en/participants/jessicaburde and click “Add a Buddy” at the top. Thanks Julie, please don’t hold your breath LOL 🙂 but I’ve got to try! But I think all writers have to be a bit crazy. I haven’t participated in this particular challenge, but I did write, photograph, produce, and publish three children’s books (ebook and print versions) in the space of 4 months. I realize that children’s books are not the same as novels, but they do require a particular writing skill and a lot of time and energy. Awww thanks Dawn! I was going to write childrens books with photographs but somehow got sidetracked! Writing three books in four months, well done! I know a number of writers who do NaNoWriMo every year and LOVE it! Two that come to mind ~ Rik Scott (Uphill Writing) and Maggie Smith (Maggie Madly Writing). They both have posts about NaNoWriMo on their blogs. Hi Nancy, thanks for the links. These are serious writers and I’m not in the same league 😦 Not sure I will LOVE it, but I’m going to give it a go. NO: you are not crazy!! YES: you are seemingly letting yourself in for a lot of hard yakka!! One of the other posts I love and regularly read is letting herself in for the next stage!!!! Heaps of good luck: shall back you up all the way as I will Celi!! Hi Eha or is it Celi, love the term hard yakka! thanks for the voice of encouragemnt! Wow, fantastic! Good for you. Just by being brave enough to set yourself such a challenge you’re bound to get loads out of it. Can’t wait to hear how you get on. thanks Austurian…I don’t feel brave right now…panic springs to mind! Great that you are challenging yourself – best of luck! What a great challenge! I would love to write a book but I just can’t think of what I would write about. I can witter on about my life until the cows come home but it would not make a good book which is why I write my blog. I have an idea for a children’s book but it only goes as far as the first line! 😀 Best of luck Piglet. I admire anyone who can write a novel. Hi Tosta, I’m sure after reading your blog you could write a book if you set your mind to it 🙂 Thanks for the encouragement…a month is a long time to keep motivated! Thank you Piglet. That is encouragement indeed. I got to the second sentence of my ‘book’ yesterday. I feel this may be a slow process! Hi Sami, I’m looking forward to the creative writing course and the fact that it is residential means I can really immerse myself in the project! This is one hell of a challenge and I’m determined to give it my best shot! I’ve signed up and yes, I think you have to be just a little crazy! I did it (successfully) last year and did have a lot of fun so am going for it again this year. Come join me and we can be writing buddies! Last year’s book was called Mental Pause (which I’m in the process of querying) and this year’s is called Deep Deceit. If you’re looking for me on NaNoWriMo, I’m Anne the Writer! Hi Anne, I could certainly do with some writing buddies for the challenge. I’ve never undertaken anything so crazy! The more I actually stop and think about this the more scary it seems and I have moments of sheer panic! As I said- there is a big difference between writing blog posts and writing a novel! Good luck. One crazy lady but am sure you will enjoy it. I’ve thought about doing it too, PiP, but that’s as far as I’ve gotten. Not sure I’m disciplined enough to participate and, as always, I have a million other things cooking. Those sound like good excuses, right? Good luck! Hi Sally, I’ve been pondering over this since last year. I’m sure you could do it! I’m not sure if I will complete the challenge but I will give it my best shot! Please let me know if you take part and perhaps as newbies we can become buddies and encourage each other! Good luck PiP, I don’t have the courage to take part in such a huge challenge. Let us know how you get on. Good Luck! Stick with it! Go PIP go! Hi patty, thanks for the words of encouragement – really appreicated! Like eating an elephant-one bite at a time. Have fun! Hi Alice, good advice, thank you! How do they know if you cheat? By that I mean if you already have a finished novel that one merely load exerpts? I wish you the best of luck. That is some pressure, believe me! I usually map out each scene/plot in a note book until I have the story more or less complete. Then it’s merely a case of ‘fleshing it out’. If you know how it will end, this helps too. Then you just have to work backwards! Hi Ark, I suppose with regard to your question about cheating, you would know…so there is no real sense of achievement. I was wondering how and where to start and until yesterday I was rather overwhelmed. Then I sat with a glass of wine or two, thoughtof the end, the beginning and then wrote some notes on the path inbetween, My next task is to take some random photos of strangers in the street who I will use as my characters… I’ve never written a book before or even thought about how to go about it…thanks for your tips so I was more or less along the right lines. I feel rather overwhelmed by the prospect, but everyone has to start somehwere! NaNo shouldn’t be thought of as scary, not unless you’re writing a dark and twisty story, in bed, under the covers, where every tiny sound makes you jump! It’s about getting your story out of your noggin and onto screen or paper. I guess you could cheat, write garbage or upload excerpts you’ve previously written. But where’s the fun in that? I suppose, for arguments sake, you could use previously written material. Last year I took about 800 words or so from a short story I wrote about 6 years ago, rewrote it a little and added it my story. I was struggling with a scene and remembered the short story and dug it out. Thankfully that bit of effort got me out of a slight slump and spurred me on. If you stick with it to the end, I’m pretty sure you’ll be over the moon! It’s a considerable achievement and worthy of a Big Celebratory Choccy Cake! Or wine. Or both. I suggest both. Gotta love choccy cake! Anyhoo, I wish you all the best luck PiP! I’ll be there rooting for you all the way! Aww Dave, thanks. When I wrote this I never even had a clear idea of a plot! Now I have the plot for next«s years as well 🙂 I think it just comes back to the old question about bloggers and writers. This challenge will certainly be a babtism of fire. Just glad they are running it in the winter months. And it usually rains loads in November! My hubs has been fab and encouraging me to do this…however, tonight it just dawned on him what it meant to write 1500 words plus in one day, every day for a month! I think my wife finally nailed it for me. I’m always complaining about how difficult it is for me to complete the novel I’m working on. But when it comes to blog challenges, I’m always ready to jump right in. She told me there’s nothing wrong with my preference. Do what makes you happy. So maybe one day I’ll finish that novel. But it’s no longer ruling my life. Your wife is right Paul you must do what you enjoy – life is too short. I like the idea though and what a great shame she made it the same month! I have so many ideas re. picture books for kids and a whole arsenal of photographs but my kids have grown up. Stop thinking of others as ‘serious writers’ or ‘real writers’! Writers write, period, so take the next step and go for it. (Blogging is merely one form of writing.) I think it’s great you’re pushing yourself with the NaNoWriMo challenge. I was all set to commit but a couple serious family issues have popped up that will likely require my attention. But I still may commit to writing as much of the 50K words as possible. Rather than think of it as ‘trying and failing,’ I prefer to think of ‘trying and not yet suceeding’. It is scary! I’ve done it before and it’s scary every time. It feels GREAT to win it, and even if you don’t, you’ll probably have a lot of fun. I’ve learned a lot about how I write by doing NaNoWriMo. I’d love to see some of what you write!